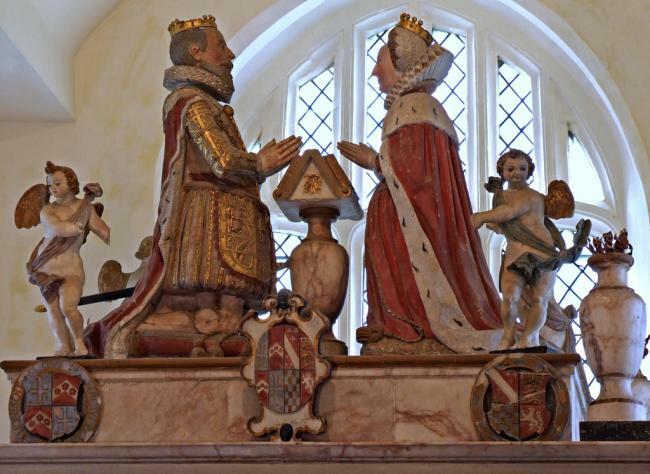 KNOLLYS, William (c.1545-1632), of Rotherfield Greys and Caversham, Oxon. b. c.1545, 2nd but 1st surv. s. of Sir Francis Knollys and bro. of Edward, Francis, Richard, Robert and Henry Knollys II. educ. Eton 1560; Magdalen Coll. Oxf. ; M. Temple 1565. m. (1) aft. Mar. 1573. Dorothy (d.1605), da. of Edmund, 1st Baron Bray of Eaton Bray, Beds., wid. of (Sir) Edmund Brydges†, 2nd Baron Chandos of Sudeley, s.p. 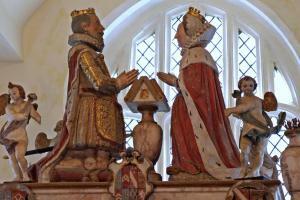 ; (2) 1605, Elizabeth, da. of Thomas Howard, 1st Earl of Suffolk, 2s. 1da. Kntd. 1586; suc. fa. July 1596. KG 1615; cr. Baron Knollys 1603, Visct. Wallingford 1616, Earl of Banbury 1626. Capt. in army in the north 1569; gent. pens. 1570-96; emissary in Scotland 1585; keeper of the Marshalsea by 1586; capt. in Netherlands and gov. Ostend 1586-7; comptroller of the Household and PC 30 Aug. 1596; delegate to the estates of Holland 1599; treasurer of the Household 1602-16; cofferer to Prince of Wales 1606; commr. of the Treasury 1614; master of the ct. of wards 1614-19. J.p. Glos. from c.1577, q. from c.1583, rem. c.1581; j.p. Wilts. from c.1582, q. from c.1583, rem. c.1587; j.p.q. Oxon. from c.1583, dep. lt. 1587, custos rot. c.1594; j.p.q. Berks. from c.1593, dep. lt. 1593; jt. (with Sir Henry Norris I) ld. lt. Berks. and Oxon 1596, sole 1601. As his father’s son, Knollys was launched early upon a career in the Commons. His return for Stafford in 1571 he presumably owed to Walter Devereux, lord lieutenant of Staffordshire and soon to be Earl of Essex, who had married Lettice, Knollys’s sister. In 1572 he sat for Tregony, probably through the patronage of the 2nd Earl of Bedford, who supervised the Cornish elections in that year. Knollys’s fellow-Member was Peter Wentworth, but despite his parentage, education (under Julins Palmer and Laurence Humphrey) and connexions, it can be stated at once that Knollys’s life shows no evidence of any religious views beyond conventional adherence to the established church. In 1584, following the death of his elder brother Henry, he was chosen knight for Oxfordshire along with his father; and in 1597 he succeeded Sir Francis as senior knight. Between 1584 and 1593 there is a gap in Knollys’s parliamentary career caused by his service abroad as an emissary and as a soldier under the Earl of Leicester, Lettice Knollys’s second husband, by whom he was knighted. The parliamentary journals do not mention Knollys until 1l2 Dec. 1584, when he was named to a committee concerning sheriffs. During the same Parliament he was also appointed to a conference with the Lords on the fraudulent conveyances bill (15 Feb. 1585). In 1593 he was more active. On 26 Feb. he was appointed to the subsidy committee as a knight of the shire; on 1 Mar. he was named to the subsidy committee, and on 3 Mar. he was on a delegation from the Commons to the Lords concerning the subsidy. He was also appointed to committees on cloth (9 Mar. ), spinners and weavers (26 Mar.) and recusancy (4 Apr. ); and he was entitled to attend a legal committee as a knight of the shire on 9 Mar. A bill against forgery was committed to him on 13 Mar. after forty-three years under her Majesty’s happy government, that we should now dispute or commit a bill of this nature. And I wonder any voice durst be so bold or desperate to cry, Away with this bill. The old statute gives the penalty, this new one only speedy means to levy it. And I much marvel that men will or dare accuse justices of the peace, ministers to her Majesty, without whom the common-wealth cannot be. If this boldness go on, they will accuse judges, and next the seat of justice itself. That all justices should be thus generally accused, this is mere barbarism indeed; when her Majesty shall have understanding thereof, it will be no contentment unto her, and a scandal unto us all. The bill, however, was committed the same day, and Knollys, as a Privy Councillor, would have had to attend the committee. ... the gentleman that spake, Mr. Martin, brake no order of the House for speaking, for the House favoured him with silence and therefore admitted to him liberty of speech ... And surely for not removing out of places, I have heard fault found before this time, and therefore the gentleman is not now to be taxed. I am sorry to see this confusion in this House; it were better we used more silence and kept better order. Yesterday you ordered the continuance of statutes should be read; now in an humour you cry, Ordnance, Ordnance. I pray you that which we first decreed let us stick to, and not do and undo upon every idle motion. A few days later, however, a Member was forcibly prevented from voting on the church attendance bill. Ralegh could see nothing wrong in this, and admitted having held back a Member by the sleeve on several occasions himself. Knollys thought it an ‘intolerable disorder’. I do think the offence an heinous offence, both against God and this assembly. For the first in that every man is to go according to his conscience and not by compulsion. And for the other gentleman (meaning Sir Walter Ralegh) that said he had often done the like, I think he may be ashamed of it. Except for a note by the Earl of Essex in 1596 that Knollys had been a captain of horse and was ‘fit to be employed’ in that capacity, there is nothing to suggest that Essex did anything for his uncle; but it is clear that until the final act of treason, Knollys was for Essex and against Cecil. Yet it was an insolent reaction by Essex to the Queen’s proposal that Knollys should take command in Ireland which caused her to box the Earl’s ears. At first Knollys declared himself ‘confounded’ at relations between Essex and the Queen, but on Burghley’s death in August 1598 he warned Essex not to leave the court at such a time and not to show a ‘careless humour’ to the Queen. Later that year he tried to mitigate the harshness of a message from Elizabeth to Essex and again urged Essex to attend more regularly: ‘by your lordship’s coming there will be a speedier end; but whether good or bad I cannot divine’. There is no record of correspondence between uncle and nephew during Essex’s time in Ireland, a period when Knollys was much occupied with the Netherlands. told him that, having been long servant to Queen Elizabeth and him, he was loth to remove him, neither would he accuse him of negligence, insufficiency or corruption, but only he had one fault ... which could not stand with his service nor of the state, that he was altogether guided and overruled by an arch-wife. Authors: Alan Harding / M.A.P. 1. De Tabley. Browne Willis gives Henry Knollys, who sat elsewhere. 2. DNB; CP; Salisbury State Pprs. ed. Murdin, 770; E407/1/6; HMC Rutland, i. 185; Harl. 2143, f. 45; CSP For. 1586-7, pp. 85, 111; 1589 (Jan.-July), p. 181; APC, xxiv. 31; xxvi. 135, 290, 469; xxxii. 75, 490; HMC Hatfield, xi. 372; A. Beesley, Hist. Banbury, 254-8; Oxf. Council Acts (Oxf. Hist. Soc. lxxxvi), 205; Berks. RO, Wallingford minute bk. f. 98v; J. K. Hedges, Hist. Wallingford, ii. 241; B. Challenor, Abingdon Recs. 141; HMC 13th Rep. IV, 381; CSP Dom. 1603-10, p. 328; Add. 1580-1625, p. 544. 3. HMC Hatfield, vi. 287, 453, 562; xi. 485; D’Ewes, 338, 349, 474, 481, 486, 493, 496, 500, 510, 517, 534, 539, 540, 541, 546, 548, 549, 552, 553, 555, 556, 557, 560, 561, 562, 564, 565, 567, 568, 570, 571, 572, 573, 574, 576, 578, 580, 581, 583, 584, 587, 588, 591, 593, 594, 595, 621, 622, 624, 625, 631, 634, 635, 636, 641, 647, 649, 657, 658, 661, 664, 665, 666, 668, 670, 672, 675, 676, 677, 678, 682, 684, 685, 686, 687; Bull. IHR, xii. 6; Townshend, Hist. Colls. 69, 73, 103, 107, 109, 111, 112, 114, 115, 116, 125, 126, 141, 173, 174, 182, 186, 189, 193, 208, 209, 253, 258, 261, 276, 290, 294, 297, 302, 307, 308, 309, 321, 330. 4. HMC Hatfield, vi. 570; ix. 188; x. 254, 307; Birch, Mems. Q. Eliz. ii. 351-2, 384, 389-91; CSP Dom. 1598-1601, p. 585; D. Jardine, Criminal Trials, 310-66; Devereux, Lives of the Earls of Essex, ii. 156. 5. HMC Hatfield, xi. 251, 372; Reading Recs. ii. 168-9, 384-6; Chamberlain Letters ed. McClure, i. 128. 6. A. E. Newdigate-Newdegate, Gossip from a Muniment Room, 7-46; CSP Dom. 1601-3, p. 98; 1603-10, pp. 200, 438; 1611-18, pp. 60, 88, 96, 101, 255, 316, 327, 416, 551, 596, 606; Chamberlain Letters, i. 179, 214, 359, 502, 556, 597; ii. 25, 35, 183, 203, 206-7, 609; Nichols, Progresses Jas. I, i. 560; iii. 486; E. K. Chambers, Eliz. Stage, iii. 244-5; PCC 83 Audley.